We’ve been taught to clean our plate, everyday we say supersize it, and you ain’t eating good food unless you have some fried chicken, macaroni and cheese, collard greens, candied yams, cornbread and biscuits. With that I say, we have CHOSEN to eat ourselves unhealthy. Meet Taiesha. After years of eating unhealthily and yo yo dieting, my friend Taiesha has finally come to the conclusion that she needs to change her lifestyle and get healthy. Taiesha was notorious for going to the park, running two miles and then have a burger with the works and fries and I was right along with her. Throughout the years I had gone through many weight loss plans. She would always ask about it but I would be reluctant in telling her because she would never follow it. Taiesha started the year off (2014) at 35 years of age, with 4 children, 5 foot 6, weighing 248lbs and wearing a size 18. Her eating habits would include having her dinner and sweet wine with sugar in it right before bed! Her husband would work out and she would be there just watching him. She got tired of being tired and came to the realization that if she kept it up she would be well into her 40’s still fat and choosing to live a lifestyle that didn’t yield healthy results. On February 28th she decided that being healthy isn’t just working out but it’s also being a responsible eater. As of May 11 she has lost 35lb,s is conscious of what she eats and works out daily. I’m telling Taiesha’s story because she was the number one person in my life that was the most cynical about healthy living. Sure she exercised because it was competitive for her, but eating healthy was not a priority. There comes a time in our lives when we must become responsible for our own weight and health, myself included! Yeah I’m fat, you’re fat too and the reason why we’re still fat is because we don’t want to give up our fatty foods! Bottom Line, Point Blank and the Period! I know I can only worry about myself but it just burns me up that we think we can continue to eat the way we do and expect to see a “change”. I know that fatty foods are good but we don’t have to have them on a daily basis. The sad thing is, we all know what we are supposed to do and we need to do it. We have to come to a responsible discussion with ourselves and come to the conclusion that enough is enough. You have to come to the conclusion that what you are doing to your body is wrong! Sure food is delicious and satisfying, but is it worth heart disease, joint pain, diabetes, obesity and death? Am I the fittest person on earth, no, but I’m making a conscious decision to be healthier and understand that what I’ve been putting in my body is crap. No one should eat themselves to 300lbs like that’s your goal and that’s something to look forward to. Am I fat shaming, no, am I saying fat equals unhealthy, no, but I am saying excess weight creates other problems that will be harder to get rid of when we get older. The process is not overnight but you have to work the process in order to get where you want to be. Below are some tips to get started. Plan Your Meals – Life can be very sporadic but you must make time for you. We’ll always fall victim to I’ll just grab something on the way if we don’t take the time to prepare our meals. If you can plan to get up and go to work in the morning, you can plan to prepare your meals. The point of all this was to get people to think about how much control they have over their own health. I hope this will inspire someone to make a lifestyle change today. 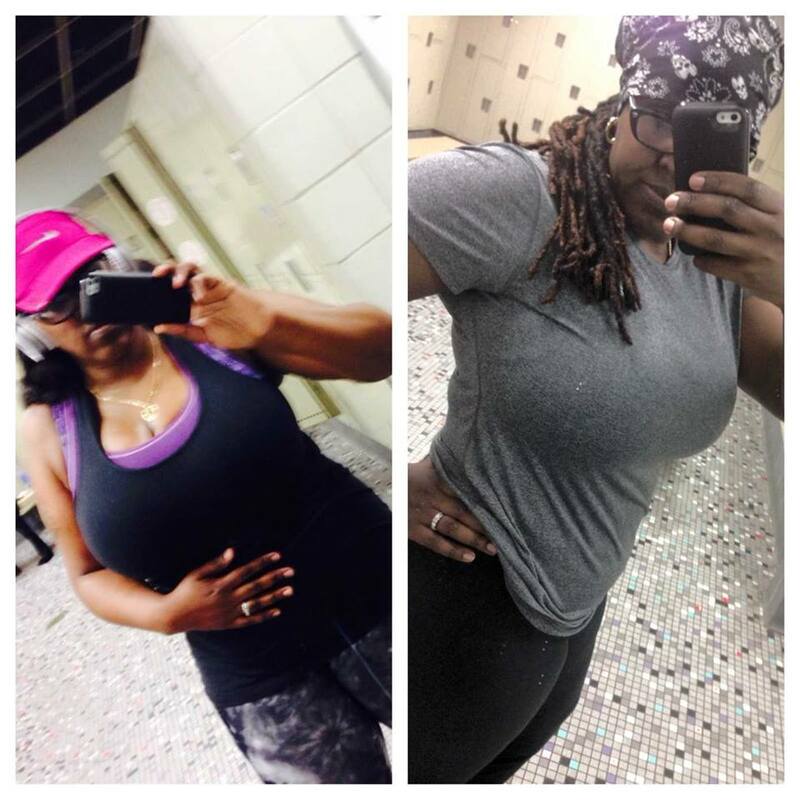 Congratulations Taiesha and I am so proud of you for realizing that exercise plus healthy living is what it takes. I will have a follow-up with her later on in the year :). You never know what the future holds but it would sure be nice to be around to see it. ← New Category! Single Lady Chronicles – Never Trust a Retail Shop Mechanic!